League of Angels II At Gamescom and Celebrity Guild Wars! 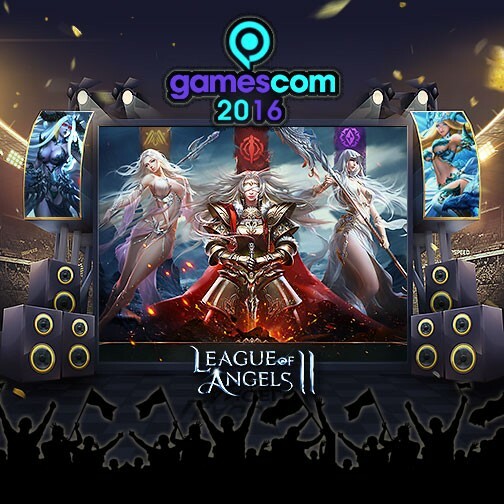 Gtarcade are excited to announce that League of Angels II attends Gamescom, Europe’s largest gaming convention, starting August 17th! This is also the first time Bigpoint joins us for a public event to jointly promote the game. As GTArcade’s premier title of 2016, League of Angels II is a free to play MMORPG that combines stunning visuals, innovative gameplay, and great storytelling to create an epic gaming experience right on your browser. With 8 million registered users playing from over 45 countries already, LoA2 is taking the League of Angels franchise to the next generation. We will be unveiling LoA2’s complete cinematic trailer for the first time during this year’s Gamescom at our booth (B042-B040 B2C Hall 10.1). The trailer will also air on local German TV channels thanks to the efforts of Bigpoint, our German team. For now, you can check out the extended preview on our League of Angels YouTube channel. The full cinematic are released worldwide when the convention officially kicks off at Gamescom! Fans attending Gamescom should definitely visit our booth for exciting live events with special guests and tons of free gifts! At the same time, LoA2 has gained the attention of online celebrities from around the world, including Michell 韓曉噯 (Malaysia), Naomi Liu (Singapore), Xiaoting (Malaysia), Itowngameplay (Spain), BersGamer (Spain), PlayHard (Brazil), MushlsGosu (United States), and Voyboy (United States). To coincide with Gamescom, 8 popular online personalities and streamers from 4 continents will be doing live broadcasts of League of Angels II on Facebook, Youtube, Twitch and other platforms. These online celebrities from around the world have gathered in League of Angels II to bring you live streams! But you can do more than just watch! Each streamer has created their own in-game Guild on servers S520, S521, and S522, and will battle it out in X-Server Expedition mode starting August 17th! Whose guild will claim the ultimate glory? The outcome is up to you! Play LoA2 now and join the Celebrity guild of your choice and fight for fame and honor! Join your favorite online celebrities during this year’s Gamescom and experience the next generation of browser MMORPG’s with League of Angels II! Follow us on Facebook fan page for more info.